A WordPress File Upload field allows users to easily upload files in a form. You can click to add files or drag and drop files into the field. The uploaded files are stored in your WordPress Media Library in the location specified in your WordPress settings. Normally, just one file can be uploaded in a File Upload field, but you can allow multiple files to be uploaded. Open the field options, scroll down to Multiple files and check 'allow multiple files to be uploaded to this field'. Learn how to display files from a multi-file upload field. When this option is selected, you will also have the option to limit how many files can be uploaded. See the File limits section for more information. By default, files uploaded in a File Upload field will remain on your site indefinitely. If you would like to automatically delete files when they are removed/replaced (in the File Upload field) or when their entry is deleted, you may open the field options, scroll down to Delete files, and select 'permanently delete old files when replaced or when the entry is deleted'. If you would like to delete files immediately after the entry is created (and after the email notification is sent), see the automatically delete files code snippet. You may use this code snippet if you do not want uploaded files stored on your site. Attach the uploaded file(s) to the email notification. Open the field options, scroll down to Email Attachment and select 'attach this file to the email notification'. If you have multiple notifications and would like to remove the attachment from some of the notifications then follow the link here. 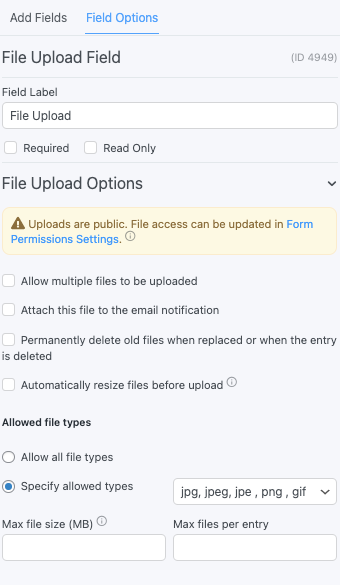 By default, any file types supported by your WordPress installation can be uploaded in a File Upload field, but you can limit the allowed file types. Open the field options, scroll down to Allowed file types, select 'Specify allowed types' and check the boxes for the file types you would like to allow. 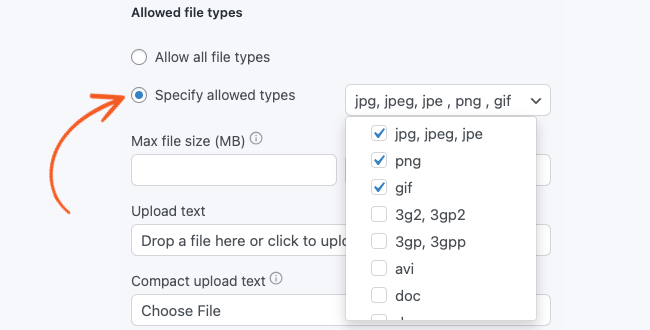 Only file types accepted by WordPress will be included in these options. If you would like to allow additional file types, take a look at the allow extra file types customization. Set the size limit in MB, for each uploaded file. Open the field settings, scroll down to File Limits, and insert the file size limit in the 'MB in size' box to set the max file size. When the Multiple file upload option is selected, the 'number of files' box will appear in the File Limits row. If you would like to limit the number of uploaded files, insert the number of files that you would like to allow. When a large image is uploaded, it can be resized before it is saved to your site. To turn on automatic image resizing, check the 'Resize files before upload' box. You can then set either the maximum image height or the width. Resized images will keep their original size ratio. Change the message on a file upload field from 'Drop a file here or click to upload' to something else. If the upload field is using the frm_compact class, the default text can be changed from 'Choose File'. Display uploaded files in a form's confirmation message, email, or View. Replace x with the ID of the file upload field. Show image: Display the image if the WordPress file is an image file type. Display an icon if the file is not an image. Add link: Link to the full-sized image. This may be used in conjunction with show_image=1, show_filename=1, or any other File Upload shortcode parameters. Open link in new tab: Open the link to the image in a new browser tab. The new_tab=1 parameter must be used in conjunction with the add_link=1 parameter. Image size: Set the image display size using either size=thumbnail, size=medium, or size=full. The default size displayed is the thumbnail. In WordPress, the default thumbnail size is a 150x150 image. Specify a different size to show a bigger image. 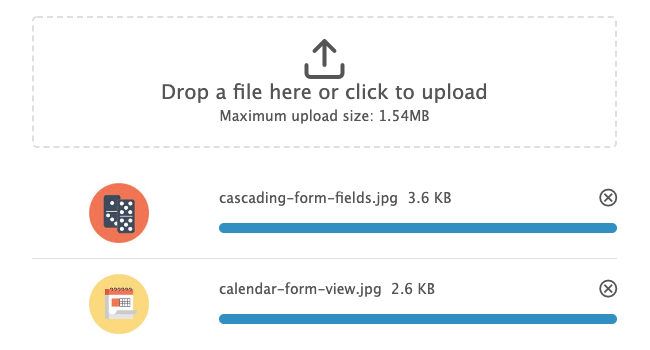 Show filename: Display the filename of an uploaded WordPress file. Show attachment ID: Display the attachment ID of an uploaded file. Show default image: Check for an image and add a default if there isn't one. Replace x with the ID of your file upload field. Replace default.png with the path to your default image. Replace x with the ID of your File Upload field . Read more about the gallery shortcode and its parameters in the WordPress Codex. Autopopulate the File Upload field with a file of your choosing. If you would like to set a default value in your File Upload field with a file from your WordPress media library, please follow the steps below. Go to your WordPress Media → Library. Select the WordPress file you want to use as your default value. The media ID will be in the address bar. Copy it. Go into edit your form and open the field options for the File Upload field. Scroll down to the Dynamic Values section. In the 'Dynamic default value' box insert the media ID of the file from step 3. Save the form and click preview. Now when the page is visited the default file will appear in the File Upload field. For more information on default values, visit the Default values page. If you would like to automatically populate a File Upload field with the most recent value submitted by the current user, follow the steps below. Open the field options for the File Upload field. Replace x with the ID of the File Upload field that you want to retrieve a value from. Save the form and click preview. Now when the page is visited, the uploaded file from the user's previous entry will be shown. If the user is not logged-in, this shortcode will have no effect. If you would like the File Upload field to take up less space in your form, you may use the frm_compact class. Scroll down to CSS layout classes. Insert frm_compact in the box. Save the form and click preview. Now when the page is visited, the File Upload field will be more compact. All files that are downloaded in a Formidable form are saved to your WordPress media library. To access the uploaded files, follow the instructions below. Click the list view icon. In the filtering menu, change 'Hide form uploads' to 'Show form uploads' if you would like to see files uploaded in your forms. Click 'Filter'. Now all the files that have been downloaded in a Formidable form should appear here in the list view. If you would always like to view your form uploads in the media library, see the prevent filtering of form uploads section. All files uploaded through your Formidable form can be protected. See the General form settings for more information. * Please note that file protection is limited to Apache servers. File privacy on Nginx servers is not yet supported. If you would like to import files from entries on one site into entries on another site, see Import files for more information. If you would like to allow file types than are not allowed in WordPress by default, you'll need some custom code. This is a WordPress filter (not Formidable). You can find more information on this filter in the WordPress codex. If you would like to prevent the filtering of files that have been uploaded through formidable forms in your WordPress media library, insert the following code in the 'Code Snippets' plugin or a child theme’s functions.php file. Disable the ajax uploader and revert to a standard uploader with the code below. File upload size and quantity limits are set in your server's php.ini. If you have a problem uploading a file in your form, first try uploading the same file on the WordPress → Media Library. If you see the same error here, then you are facing upload limits. You (or your host) may need to increase the max_file_uploads, max_input_time, post_max_size, and/or upload_max_filesize settings in your php.ini. In WordPress Multisite, the upload limits can be customized in 'Network Admin' → 'Settings' → 'Upload Settings'. When ajax requests are fired in WordPress, 0 is returned when the request isn't processed. We have seen cases where 0 is returned by the file uploader, even though the code is there to process it. The most likely cause is a plugin or theme conflict. Start by checking for a conflict. If the problem continues with all other plugins disabled, there may be an issue with your server settings. In some cases, this happens when there a page is loaded with a different URL than the one set as the site URL in the WordPress Settings. To solve the problem, you will need to add a redirect rule in your .htaccess that will redirect to the correct url. This is also better for SEO. If you're seeing a "-1" error when trying to upload a file on your form, this problem is most often related to a plugin or theme conflict. Generally, we have seen cases where a security plugin is causing this trouble. To troubleshoot this, start by finding the source of the conflict. Customize the location of your uploaded files using the frm_upload_folder hook. Automatically delete WordPress files after the entry is created (and after the email notification is sent) with the frm_after_create_entry hook. Remove attachments from notifications with the frm_notification_attachment hook. Format multiple files differently than the default HTML with the frmpro_fields_replace_shortcodes hook. Use Base64 file info with the frmpro_fields_replace_shortcodes hook. Create a custom field that stores the file URL with the frm_new_post hook. Add image meta with the frm_after_create_entry hook.